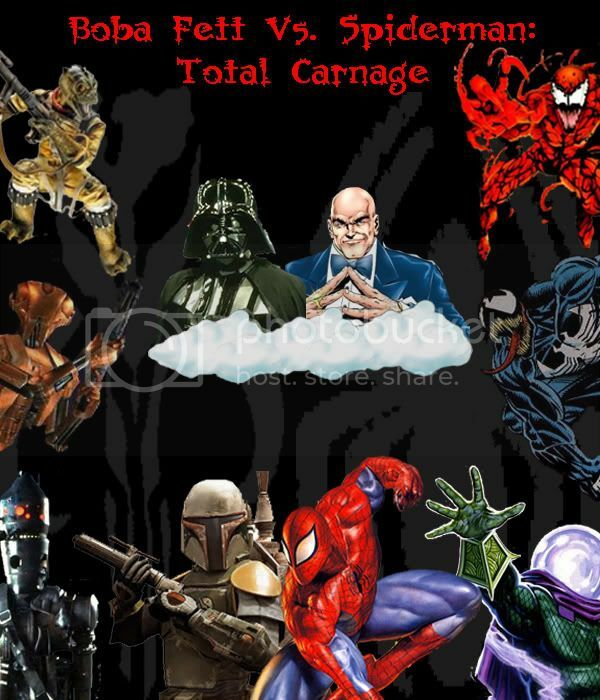 Message Boards - Boba Fett Fan Club → Creative → Boba Fett ans Spider-man: TOTAL CARNAGE! Topic: Boba Fett ans Spider-man: TOTAL CARNAGE! This is the cover to the sequel to my boba Fett vs. Spider-man story. Whatcha think? Re: Boba Fett ans Spider-man: TOTAL CARNAGE! 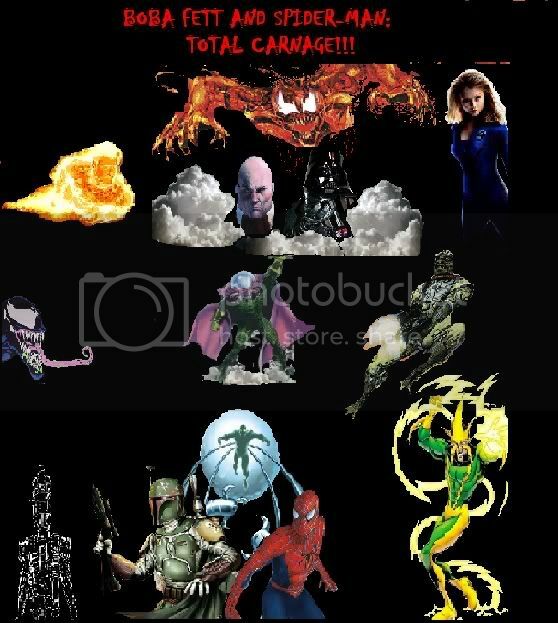 The Fett/Spiderman/Doctor Octavious part looks great, bu the rest looks too... thrown together. Why are Johny and Susan Storm there? (a.k.a. Human Torch and Invisible woman) I know they are marvel, but they barely ever met. Why... is it making me laugh? Yeah, it does look kind of tacky, but the only program I had to work with at the time was Microsoft paint, so yeah. Now I've got paintshop though, so you just might see a better one coming soon. Anyway, here's a breif summary of the story. The time period is between Star Wars A New Hope and The Empire Strikes Back in the Star Wars universe, and shortly before the formation of the New Avengers in the Marvel Universe.. Darth Vader and the Emporor have just discovered from outside sources that, in the distant milky way galaxy on the planet earth exists a weapon that if aquired, could change the course of the civil war between the rebellion and the empire. The weapon? A certain red symbiotic organism bonded to serial killer Cletus Kassady, creating the ultra powerful supervillian, Carnage. Of course, somebody has to get it for them. And both Vader and Palpatine know that there's only one man for the job--Boba Fett. Vader hires Fett to return to earth, where he previously battled Spider-man, kill Kassady, and retrieve the symbiote. But this could prove an impossible task, even for Fett. Not aware of the Emporer's dark purpose for the symbiote, Fett embarks on what could be the most dangerous mission of his career, returning to earth. Once there, he runs into infinite difficulties, not the least of which is crossing paths and tangling with Spider-man there. Also, the Kingpin is quite dissapointed in Fett for not delivering Spider-man during Fett's last trip to earth, and the Kingpin doesn't like being dissapointed. He wants revenge. Then, Fett faces Carnage himself, and begins to realize he might have bitten off more than he could chew by taking this mission. Vader soon realizes that even a force such as Fett might not be sufficient to this task, and decides he must go to earth and handle this himself, taking two of the galaxies most deadly mercenaries with him--IG-88 and Bossk. He intends to obtain Carnage and take to the Emporer, and crush anyone who gets in his way, or knows too much--including Spider-man and Boba Fett. Once he arrives on earth, he meets the Kingpin. Sharing some common interests, the two forge a temporary partnership and hire several of the unuverse's most dangerous villians to create an all new all deadly Sinister Six, composed of Doctor Octopus, Electro, Venom III, Mysterio, IG-88, and Bossk, charged with the task of eliminating Spider-man, Boba Fett, and Carnage. Unknown to all parties concerned, however, the Kingpin is merely a pawn being manipulated from behind the scenes by a far more deadly, evil, and sinister source, who is interested in these extraterrestrial beings. (I'm not telling you who it is--but wait till you see! I'll give you one clue, he cackles a lot.) Now, faced with the task of dealing with Carnage, the new Sinister Six, Darth Vader, the Kingpin, this mysterious evil, as well as saving both of their universes from an unimaginable fate, Boba Fett and Spider-man are forced to put aside their differences for the greater good and team up (along with a little help from some other heroes along the way, hence the human torch and invisible woman.). But can Fett ans Spider-man survive these perils? Will they succeed in saving their universes? Who is this mysterious evil? And can they survive...eachother? All the answers coming soon as soon as I finish the story! It sounds great. I am guessing that that the extrateresstrials may the Skrulls, Thanos, or (If it does not have to be from original comics) Lovecraftian gods. Thanks, but by extraterrestrials, I was actually refering to Vader and company. This unnamed villian in interested in them, and why they are on earth. Spider, would you mind if I made my own version of you pic? It was a good idea, and I have been looking for a reason to use Photoshop again. By all means do so, I'd like to see what your talents can do for it. I think it turned out well, up for suggestions. Nice. I like the background. Not my favourite Spiderman picture though. The font could be cooler. Otherwise great! word, im not sure why but that montage makes me laugh too. at anyrate, one of the craziest cross-overs ive ever seen. OK V2!!! 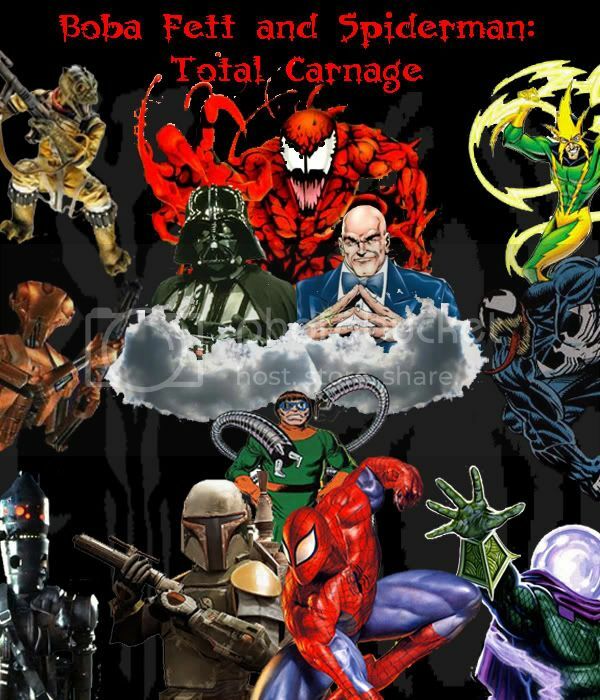 Dok Oc and Electro added, text changed, made the clouds less cartoony, put Carnage up top in a more sinister position cuz i read the overview and realized he is on a team of his own. And as for the spiderman some of you don't like, that is the only version I could find that didn't involve toby macguire or a stupid kiddy or new wide eyed version. He looks 10x better the old way. ps. Hk-47 is only there because he is awesome, and made the sides equal, plus spider-fett said they would meet others along the way... Oh and I hope Captain America isn't in the story... cuz he unfortunately died just recently. Maybe he could be another assasin sent by the "unkown evil" (whom I think I know) but has taken taken too long and has been pulled from the project. But HK never quits a mission, so he adds an aspect of confusion, excitement, and randomness. And yah, I said the same thing about Cappy, but I don't know now since it is a strange time to kill him off... And with all the publicity it could take a while to bring him back. He may be down for at least a few years. Good idea. So you think you know who the unkown evil is, eh? well, pm me your guess and I'll tell you if you're right. If you're wrong, I'll still tell you who it is, since you did the cover. good pictures, whoever made them! Actually, it's been revealed that Crossbones did ol' Boy Scout in. In other words, it was NOT some nameless sniper who killed Cap, but one of his biggest enemies. I think I know the "nameless evil" as well, Spider-Fett. Here's a suggestion: put Venom/Eddie Brock instead of Venom III. I mean seriously, Mac Gargan? Venom would kick his @$$. Also, Venom is a much more......inspirational character than some background character like "Venom III". There is only 1 Venom. And that's Venom. Hear, hear! It's only a matter of time before Eddie and the symbiote are reunited. I need the real Venom. Not some retarded Mac Gargan imitation. Hey mandalorian assasin, pm me your guess as to who it is.